Four POVs: Autumn, Sylv, Clare, and Tomas. I can't say it's a slow start because there was already something going on in the beginning. There was tension. There was that feeling something would go wrong. It's what the characters were going on about. It's the atmosphere Nijkamp already set up by writing the time in the beginning of each chapter. Yet, it did felt so slow for me. The character establishment felt really rough for me. 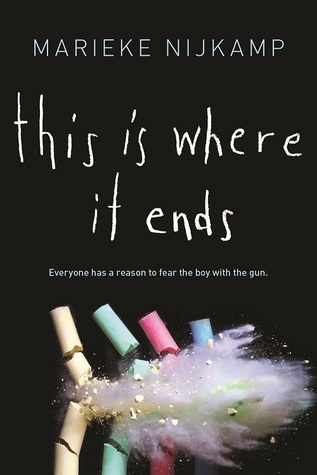 I had a hard time remembering everyone's connection with each other and with Tyler, 'the boy with the gun.' It took me three to four chapters to finally decide to map out their connections as to not forget who's who. Despite that, I have to take note of each character's story and relation to Tyler. I like how they slowly tell their story. How they slowly reveal to the reader why Tyler is broken. Why he's perhaps doing what he's doing. Did it moved me? Yes, it did. This is Where It Ends is that kind of book. I was not strongly attached to the characters, unfortunately, but I LOVE Tomas. He was the one that really stuck to me. Sadly, I did not shed a tear for this novel although I do feel that I should have. The ending really moved me - the things they did, the words they said. It was really painful. OVERALL, This is Where It Ends is a psychological and heartbreaking novel. While I was not immediately pulled in because of my struggle with the multiple POVs, I still fell in love with it particularly because of the ending. It really moved me. What I Didn’t Like: (1) the multiple POV - it initially confused me, (2) I wasn't exactly attached to the characters (except for Tomas, I guess but that happened later on in the novel.. around 70% or 80% in), (3) how unreasonably short the time frame (the time indicated) per chapter is - I don't know about this but that's what I've been wondering about. They don't feel like 2 or 3 minutes for me. They felt like 5 or 6. Yes, the additional couple of minutes matters to me (sorry).